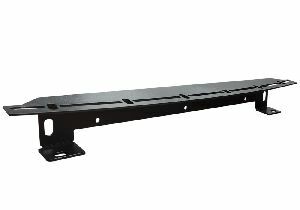 Showing 1 - 2 of 2 Products for Bumper Bracket. N-FABs new line of LBM Bumper Mounts allows for the installation of LED light(s) into factory front bumper openings. With no cutting, drilling, or modifications required, these bolt-on mounts apply to pre-existing factory hole locations for ease of install. Featuring our patent-pending Multi-Mount technology, N-FABs LBM Bumper Mounts allow for a combination of LED light(s) up to your bumper openings dimension. Universal for most LED light manufactures, these mounts come in a standard Textured Matte Black powder coat finish over a complete aluminum-assembled construction. Backed by a 5-year finish and lifetime craftsmanship warranty! 2009-2014 Ford F-150 Center Bumper Mount - This mount provides a sleek and stylish way to install a Rigid Industries E-Series 20" LED light bar (light bar sold separately). This kit is made from high quality powder-coated stainless steel and includes a limited lifetime warranty. Professional Installation is recommended.